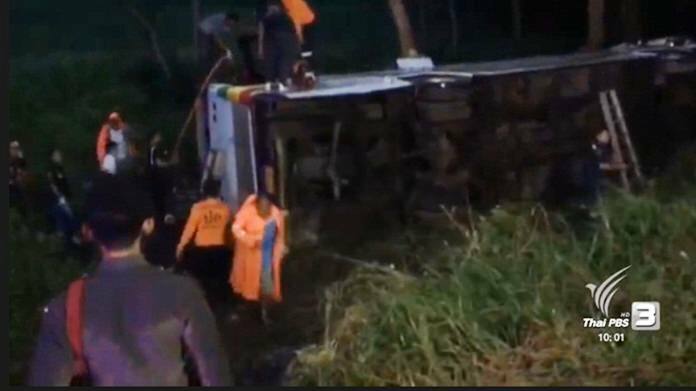 Fifteen foreign tourists, were injured when the chartered bus they travelled from Bangkok to Surat Thani went off the highway, flipped over and overturned before dawn Wednesday in Thachana district. The accident happened on Highway 41 in Surat Thani at 05.22 am today. Highway police said the bus with 17 foreign tourists was on the way to Krabi province after leaving Bangkok yesterday evening. It skidded while making a curve, flipped over and overturned into the roadside bushes. Fifteen tourists were injured, one of them trapped inside the overturned bus. Rescue team arrived at the scene after being alerted, and quickly rushed all the injured to Thachana hospital.